Almond Girl Jenny (AG): Can you give us a brief introduction of your company and how it relates to agriculture? Matthew Haddon (MH): Sierra Gold Nurseries has been producing fruit and nut trees for orchardists since 1951. The mother blocks of source material for propagation as well as the finished nursery trees are all produced on about 1,000 contiguous acres of fields and greenhouse/shade house facilities just outside of Yuba City, CA along the Feather River. Sierra Gold is a family owned and operated company with very rich heritage of fascinating agricultural roots. AG: How long have you been in operation? 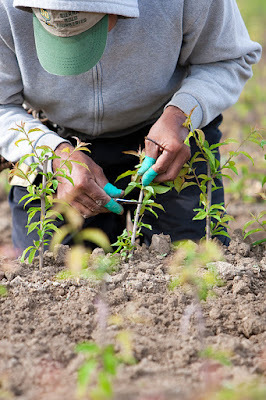 MH: The founder, Walter Berg began growing trees in 1951 with his father-in-law CE Sullivan who was one of the largest cling peach growers in the world at the time. Sullivan was also a soil scientist who had helped generate the original USDA-SCS soil maps in the Sacramento Valley that the industry still uses at the present time. 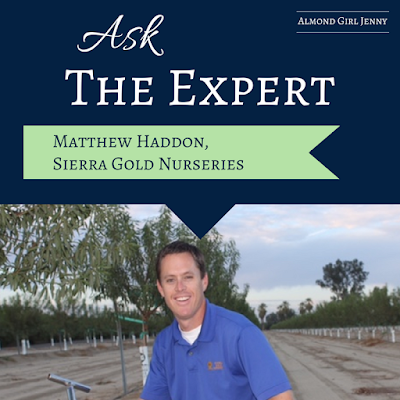 That knowledge base of where the best soil could be found enabled him to acquire some wonderful farm properties, which still serve Sierra Gold Nurseries today. In fact, the headquarters property now has a historic landmark at the front gate as it is known as the "Hock Farm" property– the very first commercial farm in the Sacramento Valley which was founded by John Sutter in 1841. AG: How is the family involved today? AG: So just how is a tree grown at your nursery? MH: The production methods for the different types of trees vary according to the cultivar that is produced as well as customer preferences for certain things such as potted vs. bare root, finished (budded) tree vs. rootstock only, etc. Some trees can be grown well from a seed, a cutting, or from tissue culture…some can only be grown reliably from 1 or 2 of those methods. The typical turnaround time for most trees sold is about 14 months. MH: Rootstock is the part of the finished tree below the graft union. The part above the graft union (or bud union) is called the scion wood or the "variety". For example Nonpareil is an almond variety and Hansen or Nemaguard are 2 commonly used rootstocks in the San Joaquin Valley. The rootstock is usually a cultivar within the same genus but a different species from the variety and thus has the ability to have desirable growing traits and is compatible with the variety though it may not produce any crop on its own. AG: Why do almond farmers use grafted trees? MH: Nonpareil planted on its own root stock would not grow or produce consistently for any length of time before being overcome by nematodes, diseases, or less than ideal soil chemistry such has high boron, salts, or a myriad of other agronomic issues. However, a rootstock on its own would not be able to produce a crop that is even remotely like the crops that we eat if it could even produce anything at all since it is a different species. Having an almond variety budded onto a rootstock enables consistent production of a valuable food product for many years and is thus the best of both worlds in that by using this propagation method we are "harvesting" the positive traits in a rootstock such as salinity and nematode tolerance while at the same time keeping the size, shape, color, and taste of the Nonpareil kernel that makes it so desirable around the world. AG: How do farmers pick the best rootstock for their farm? MH: As a general rule of thumb, it is wise to choose a rootstock when possible that will counter act those "every year" kind of problems or diseases that are a concern to a grower on a certain property. 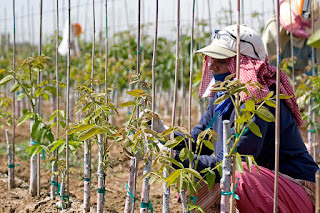 Overall, it is possible to choose a wrong rootstock but not possible to choose a perfect one. In other words there is usually one you should stay away from but 2 or 3 that are pretty comparable for most sites. For example, in Kern county you would never plant an entire orchard on Lovell rootstock but instead would do well with either Hansen, Bright’s Hybrid 5 or Nemaguard. AG: What are the biggest challenges affecting your business today? MH: The top 3 biggest challenges affecting the industry today are 1. Regulations 2. Regulations and 3. Regulations. The current and future constraints on water and labor have drastically increased the relative risk assessment for Ag production in the Southern San Joaquin Valley. Over the next 10-20 years the way we farm and harvest our fruits and nuts will certainly change due to less water, expensive labor, and air regulations to name a few. As a nursery we are very cognizant of the fact that a great deal of our business has been and continues to be in the south valley. Naturally, we are concerned about the future growth potential of the industry while at the same time remaining vigilant about staying informed and providing a product that will reduce farming risks as much as possible by making a strong start to each and every orchard of trees that we ship. Hope this answers your almond tree questions and helped you understand why farmers make some of the decisions we make. Have more questions? Shoot me an email, comment below or hit me up on social media. I will find an expert for your tough questions!